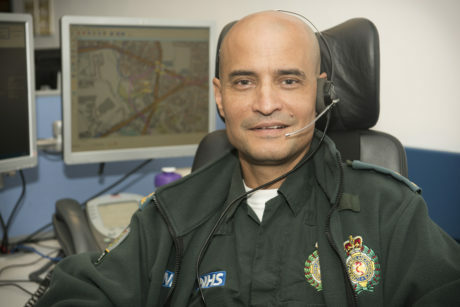 Donovan works as an Emergency Medical Dispatcher in one of our two control rooms and has worked for us for 15 years. His most memorable moments are taking calls during the 7/7 and Westminster terror attacks. I joined the Service 15 years ago after emigrating here from India. I joined because I wanted to do something exciting, a job where you can do something special. Not all the calls we get are like that but even after all these years, I still feel I can make a difference to people’s lives and that is fantastic. I answer 999 calls – sometimes from the public, but also from the police, the fire brigade and GPs. I triage the call, taking as many details as possible from the caller so we send the best response. You need to be able to remain calm in an emergency. Often people will be panicking but what makes me able to do my job is that I can give instructions with authority. I reassure the caller and tell them I will take care of them but I’m also firm about what they need to do. You need to be able to switch off after a shift but it can be hard, especially after difficult calls like when a child has died. How does your job make a difference to the lives of patients? I have been on the end of the line while many babies have been delivered. The hardest part is trying to get the father to calm down! That’s so important for this job, trying to calm people down. I’ve also talked people through CPR, helping them to save lives and I recently spent 40 minutes talking to a young woman who said she was suicidal. By the end of the call, she said she wouldn’t do it. What’s your most memorable moment working for the Service? I was working when the bombs went off on 7/7. I also took the first call after the Westminster Bridge terror attack. The caller said a van had knocked someone over. As I was talking to him the caller realised there was another patient, and another and another – 10 people knocked down.